Together, Big "I" Flood and Selective's relationship helps deliver members an unparalleled flood program. A-Rated Excess & Surplus Lines carrier offering Homeowners, Rental, Condomium, & Vacant Dwelling insurance for risks other carriers decline or are unable to write. When it comes to providing the best solution possible for your affluent clients, make sure they're Chubb. Insured. ERISA Bonds or Pension Trust Bonds are designed to protect the pension programs. An appointed person manages the plans and oversees the programs. These bonds are to protect the money in the plans against fraud and dishonest acts by the appointed person. ERISA does require a bond of 10 percent of the value of pension and profit-sharing funds. The maximum the principal is required to carry is $500,000 for qualified assets and $1MM for non-qualified assets. What is ERISA? The Employee Retirement Income Security Act of 1974, or ERISA, protects the assets of millions of Americans so that funds placed in retirement plans during their working lives will be there when they retire. 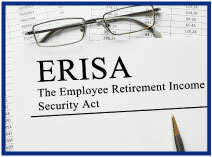 ERISA is a federal law that sets minimum standards for pension plans in private industry. ERISA does not require any employer to establish a pension plan. It only requires that those who establish plans must meet certain minimum standards. The law generally does not specify how much money a participant must be paid as a benefit. Requires plans to provide participants with information about the plan including important information about plan features and funding. Sets minimum standards for participation, vesting, benefit accrual and funding. Requires accountability of plan fiduciaries. Guarantees payment of certain benefits if a defined plan is terminated, through a federally charted corporation known as the Pension Benefit Guaranty Corporation. Employers can create qualified retirement plans - designed to offer individuals added tax benefits on top of their regular retirement plans, such as IRS; or non-qualified retirement plans - those that are not eligible for tax-deferral benefits. The main difference between the two plans is the tax treatment of deductions by employers. Generally speaking, there are two types of pension plans: defined benefit plans and defined contribution plans. A defined benefit plan promises participants a specified monthly benefit at retirement. The defined benefit plan promises participants a specified monthly benefit at retirement. The plan may state this promised benefit as an exact dollar amount; or, more commonly, it may calculate a benefit through a plan formula that considers such factors as salary and service. A defined contribution plan, on the other hand, does not promise a specific amount of benefits at retirement. In these plans, the participant or the employer (or both) contribute to the participant's individual account under the plan. These contributions generally are invested on the participant's behalf. And the participant will ultimately receive the balance of their account which is based on contributions plus or minus investment gains or losses. Goldleaf Surety Services has a number of good surety markets that write ERISA bonds or Pension Trust bonds. For ERISA bonds - and all types of bonds - you can access Goldleaf Surety through Big "I" Markets. Simply log in to www.bigimarkets.com or email us at bigimarkets@iiaba.net and an underwriter will contact you. 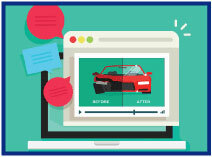 Ray Crisci, SVP and North America Auto Product Manager for Chubb Personal Risk Services, will present a webinar entitled "Safety First" which compares and contrasts the way Chubb settles auto claims differently than other auto insurers. In this second webinar in Chubb's educational series, Crisci will explain why a high level of claim adjustment expertise is required to ensure that today's increasingly complex vehicles are fixed correctly in order to ensure their safety systems perform as designed in the event of a subsequent accident. To learn more about Chubb Masterpiece auto program, join us on Wednesday, March 29 - 2:00 - 3:00pm EDT. Click here to register. Cost: Free. U.S. aviation officials predict that drones "will be the most dynamic growth sector within aviation" over the next few years. With the number of commercial uses equally on the rise, the availability and necessity of drone coverage has moved to the forefront. Those who operate a drone for hire or pay a drone operator to provide services for their business may be eligible for drone coverage under a Home Business Insurance policy from RLI, which includes coverage for designated unmanned aerial vehicles (UAVs) with a maximum gross take-off weight (MGTOW) of 55 pounds. Most UAVs will fall into RLI's light category with a MGTOW of up to 15 pounds. At the $1 million liability limit, anticipate per light UAV liability charges of $500 for full coverage and $350 where personal and advertising injury is not permitted. In April 2017, RLI will begin offering drone coverage for owners who use their drones in one of its 140 eligible business classes. The most common eligible commercial uses are real estate photography, wedding and family photography, home inspections, and business who provide drone services/unmanned aerial photography to others. Owned drones can be included in business personal property coverage on a specified perils basis. This does not include crashes or lost drones but it does cover theft, fire, and other specified physical damage. Rating for business personal property (including UAVs) is subject to RLI's normal class rating plan. Bodily injury and property damage coverage can be provided as well as personal and advertising injury related to drone operations in some cases. RLI is a specialty insurance company serving niche or underserved markets. RLI's proven, superior underwriting model creates flexibility to write unique coverages in a wide array of diverse industries. RLI streamlines processes, eliminates red tape and puts decision-making in the hands of expert underwriters, giving them the resources and freedom to drive growth so producers can quickly and easily get customers the coverages they need. Visit www.iiaba.net/HomeBusiness to learn more. *Approval and implementation may be delayed New York. The application will require the make, model, FAA registration number and MGTOW of each covered UAV and the name and date of birth of each authorized operator. A copy of an FAA Small UAS Certificates of Registration will be required for each owned UAV and a copy of an FAA Airman Certificate or Temporary Airman Certificate will be required for each operator. NEW - Wednesday, March 29 - 2:00 - 3:00pm EDT. "Chubb Masterpiece for High-Value Homeowners - Automobile Coverage". Ray Crisci, SVP & North America Auto Product Manager for Chubb Personal Risk Services, will present “Safety First” which compares and contrasts the way Chubb settles auto claims differently than other auto insurers. The second webinar in Chubb’s educational series, Ray will explain why a high level of claim adjustment expertise is required to ensure that today’s increasingly complex vehicles are fixed correctly in order to ensure their safety systems perform as designed in the event of a subsequent accident Click here to register. Cost: Free. RESCHEDULED - Thursday, March 30 - 3:00 - 4:00pm EDT. "AIG Private Client Group Coverages - Personal Umbrella". Join Lisa Gelles, AIG Private Client Group Business Development Manager as she breaks down AIG's Private Client Group's umbrella coverage. In today's litigious society, one lawsuit can do significant damage to even the wealthiest of individuals. Adequate liability protection is more important than ever. The liability coverage included within homeowners, auto and yacht policies is considered primary insurance; it responds first in the event of a claim. Excess liability (also known as "umbrella") insurance responds after primary coverage limits are exceeded. For example, the liability limit on many homeowners' policies is $300,000. If someone is injured on your property and awarded damages above that, you're personally responsible for the remaining balance, including legal fees. To learn more about AIG Private Client Group's umbrella program, please Join Lisa Gelles, AIG Private Client Group Business Development Manager on March 30 at 3:00pm EDT. Click here to register. Cost: Free. NEW - Wednesday, April 19 - 2:00 - 3:00pm EDT. "Big "I" Swiss Re Corporate Solutions Quarterly Risk Management Webinar". The Big "I" Professional Liability/Swiss Re Corporate Solutions quarterly risk management webinar is approaching. Agency Risk Management Essentials: Preparing for a Catastrophic Event is scheduled for April 19, 2017 at 2 P.M. Eastern and will discuss effective ways insurance agents and brokers can reduce their risk of catastrophic E&O claims. The discussion will be presented from the viewpoints of an insurance agent, a Swiss Re Claims specialist, an E&O defense counselor and a Selective Insurance Company of America representative. The session is free to Big "I" members. Please register today. More promotional materials are forthcoming in state news in the coming weeks. If you have any questions relating to the topic that they would like addressed during the discussion, please email Jim Hanley no later than April 1, 2017. Cost: Free. Don't miss the following education opportunities provided from the Big "I" Virtual University experts that focus on topics agents need to know to make a smart start in 2016. For more information, contact national staff. March 15 - 1:00 - 2:30pm EDT. "Is the Absolute Pollution Exclusion Really Absolute? Hint: NO!". ". During the 90 minute webinar Chris Boggs will tear into, or tear apart, the so-called "absolute pollution exclusion." Beyond a detailing of the exclusion and its exceptions, we: (1) Discuss and detail some key terms and concepts found within and applicable to the "absolute" pollution exclusion; (2) Define "pollutant"; (3) Detail the need for a "causal connection" between the release of a pollutant and damage; and (4) Introduce the historical purpose of the pollution exclusion. Click here to register. April 19 - 1:00 - 2:30 EDT. "Untangling the Work Comp Mess" - Part 1 of 2. Workers' compensation is a relatively easy coverage to understand. Work comp is work comp is work comp. The difficulty in work comp does not arise out of the policy but rather from the myriad statutes that surround and control how a work comp policy responds. April and June webinars combine to untangle many of these laws that cause problems. Two key questions to be answered during in the April webinar include: What makes an injury or disease compensable under workers' compensation? Who is covered by the work comp policy? Plus more. Click here to register. Last week, I shared my surprise that my home town of Madison, Wisconsin, with its three lakes, a river, and countless streams (not to mention many marshes) had only 147 National Flood Insurance Program policies. Perhaps I shouldn't have been surprised as Wisconsin joins 11 other states in with penetrations below 1% and there are 32 states which have penetrations below 2 percent. No doubt there are many communities with very few flood policies per household. A reader asked me for a map. 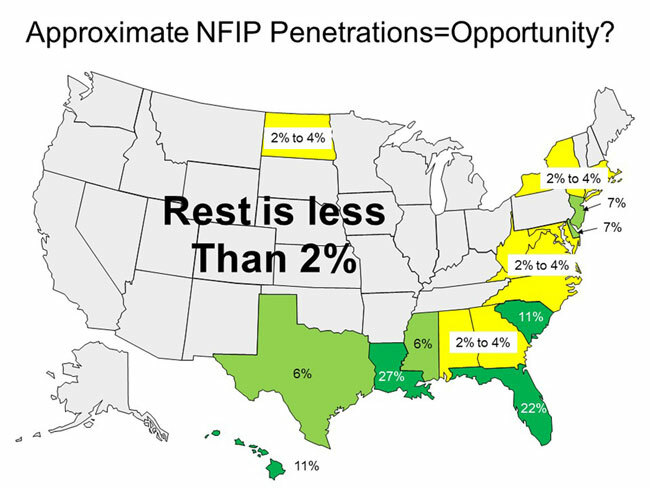 That map is below and the NFIP statistics are available for your state as well as your city/county here. States with penetrations below 1% are: Missouri (0.9%), Idaho (0.9%), Alaska (0.9%), Kansas (0.9%), Illinois (0.9%), Wyoming (0.8%), Ohio (0.8%), District Columbia (0.7%), Wisconsin (0.6%), Michigan (0.6%), Minnesota (0.5%), Utah (0.3%). We hope readers of this newsletter are well aware that we have a Big "I" Flood program available. Together, Big "I" Flood and Selective's relationship helps deliver members an unparalleled flood program. Together, we offer agents several layers of support to meet any and all flood insurance needs. Get to know the Big "I" and Selective staff and get your flood questions answered. With personalized support, competitive commissions, and an easy-to-use quoting platform, it is an easy decision to start writing your flood business through the Big "I" Flood-Selective partnership today. Learn more at www.independentagent.com/Flood. Congratulations to our agent in Alabama on a Small Commercial Standard Markets sale of $21,126 in premium!